Google’s been on a roll with updates to its apps recently. The note-taking app Keep, launched in March, has been redesigned for the Web and introduces some new functions. And Android Device Manager, the service to track down stolen or lost phones, now has an app for other Androids. 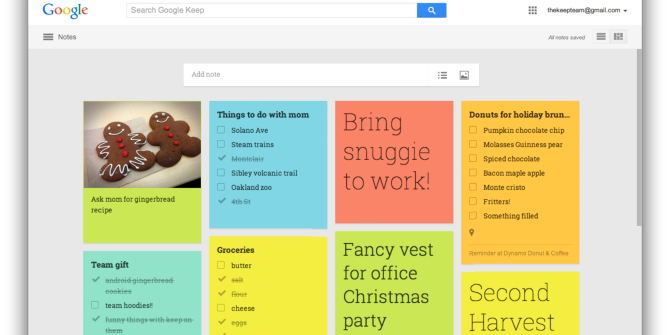 Google Keep is available online at keep.google.com, and as an app on the Chrome Web Store and Google Play Store. It’s not yet cross-platform though, so Evernote is still your best bet if you want that functionality. Meanwhile, Android Device Manager (ADM) — the service from Google that lets you locate misplaced or stolen phones — is now available as an app, which you can install on another Android device to find your phone. ADM lets you see any device associated with your Google Account, ring to locate them, or remotely wipe them. “The app is particularly useful if you’re out and about and don’t have access to a computer,” Google says. Of course, ADM is just one part of what to do if your Android is lost or stolen Was Your Android Phone Lost or Stolen? This Is What You Can Do Was Your Android Phone Lost or Stolen? This Is What You Can Do There are many good options for remotely locating your stolen phone, even if you never set anything up before you lost your phone. Read More . Explore more about: Google, Note-Taking Apps. More Google spyware! The more Google tries to buy out competition, the more I try to dodge Google.